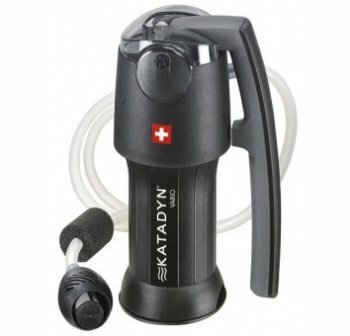 I was very excited when our Katadyn water filter arrived. Why? Well, first of all because I have never had anything like it before. It's a very cool little water purifier and I know we'll always have pure drinking water by owning it. Storing large amounts of water takes a lot of space. Most of us cannot store enough water for more than maybe a week. It just takes up too much room. Yes, I've seen huge tanks that could actually be set up in your backyard, but I can't afford one of those. I applaud anyone who can. We have a small reservoir near us that our city has turned into a recreation area. It includes a nice beach, swimming, volley ball set ups, and just plain fun for the residents. It's nice to have it close by in case of a disaster. I know we can take our Katadyn water filter up there and purify the water for our needs. Clean water any time - any where. 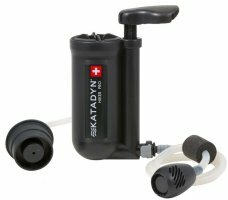 The Katadyn water filter is lightweight and easy to use for backpacking or camping. So it has dual uses. It can easily be used in a disaster situation as well as out in the wilderness for camping and hiking. 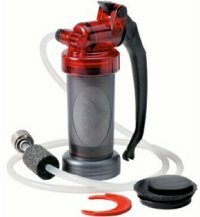 I mentioned its size but with its dual piston technology, it takes so little effort to pump but provides continuous output faster than any other filter out there. It produces filtered water on both the up-swing and the down-swing when pumping the handle. It can produce up to two quarts per minute in "FASTER FLOW" mode and one quart per minute in "LONGER LIFE" mode with an easy twist of the filter. It will also easily attach to most water bottles and hydration systems. It has a MULTI-STAGE filtration system. The multi-stage filtration system is what gives it a "faster flow" mode or a "longer life" mode. Replaceable carbon granulate inner-core reduces chemicals, pesticides and bad taste in water. Cleanable ceramic disk lengthens life of the primary microfilter. The 0.3 Micron high surface area pleated glass fiber microfilter removes waterborne bacteria, cysts chemicals/toxins, particulates, and protozoa . Watch how easy it is? I bought mine here — I love it!